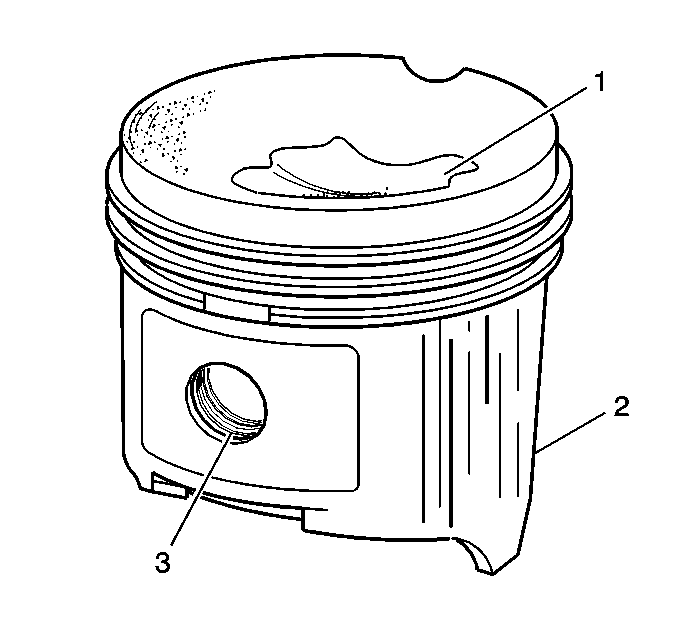 Clean the piston skirts and the pins with a cleaning solvent.DO NOT wire brush any part of the piston.Clean the piston ring grooves with a groove cleaner. Makesure oil ring holes and slots are clean.Inspect the pistons for the following conditions:Cracked ring lands, skirts, or pin bossesRing grooves for nicks, burrs that may cause bindingWarped or worn ring landsEroded areas at the top of the piston (1)Scuffed or damaged skirts (2)Worn piston pin bores (3)Replace pistons that show any signs or damage or excessivewear.Measure the piston pin bore to piston pin clearances usingthe following procedure:Piston pin bores and pins must be free of varnish orscuffing.Use an outside micrometer to measure the piston pin in thepiston contact areas.Using an inside micrometer, measure the piston pinbore.Subtract the measurement of the piston pin bore from thepiston pin. The clearance should be within0.002–0.012-mm(0.00007–0.00047-in).If the clearance is excessive, determine which component isout of specification. 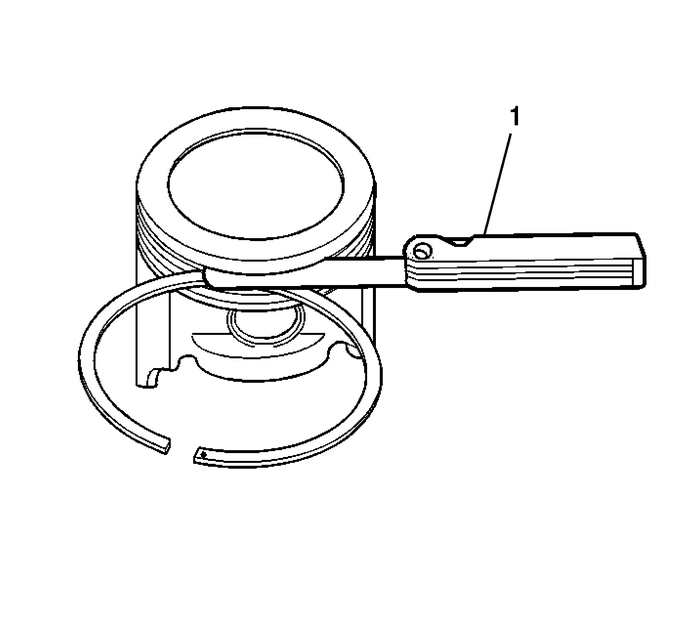 Measure the piston ring end gap using the followingprocedure:Place the piston ring in the area of the bore where thepiston ring will travel (approximately 25-mm or1-inch down from the deck surface). 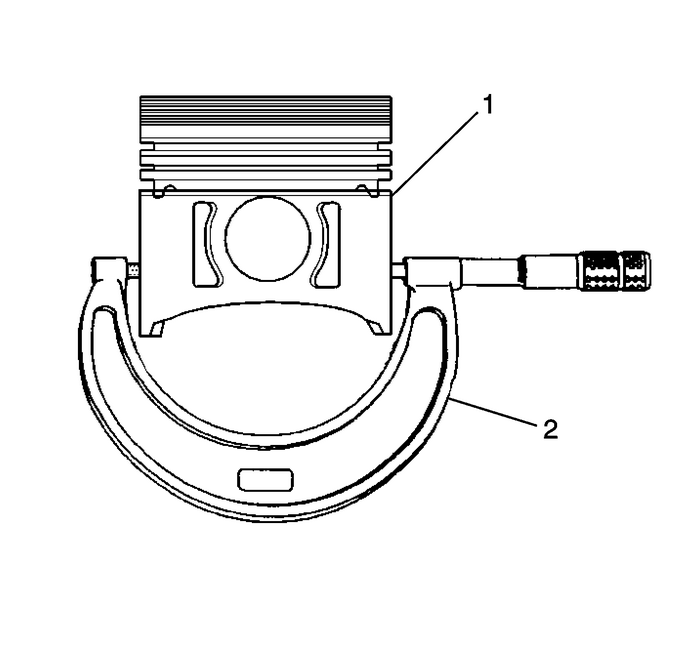 Be sure the ring issquare with the cylinder bore by positioning the ring with thepiston head.Measure the end gap of the piston ring with feelergauges-(1). 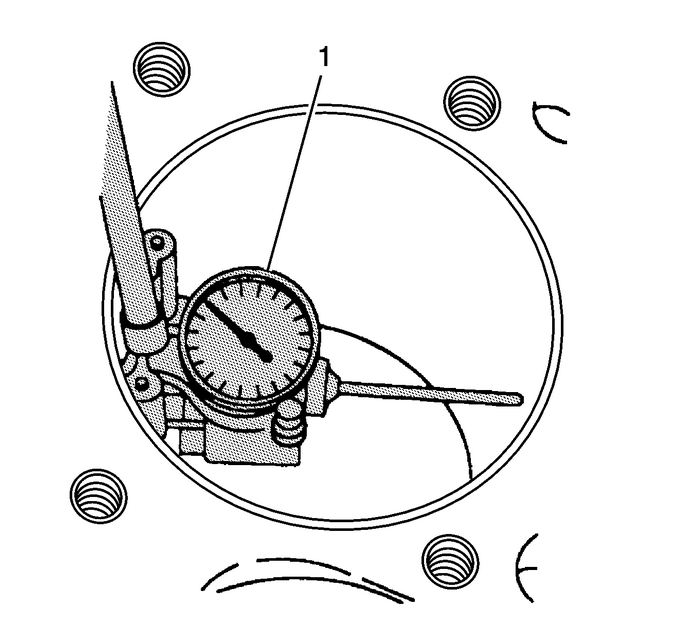 Compare the measurements with those providedbelow:The top compression ring end gap should be0.20–0.40-mm(0.0060–0.015-in).The second compression ring end gap should be0.35–0.55-mm(0.0137–0.0216-in).The oil ring end gap should be0.25–0.76-mm(0.0098–0.029-in).If the clearance exceeds the provided specifications, thepiston rings must be replaced.Repeat the procedure for all the piston rings. Measure the piston ring side clearance using the followingprocedure:Roll the piston ring entirely around the piston ring groove.If any binding is caused by a distorted piston ring, replace thering.With the piston ring on the piston, use feelergauges-(1) to check clearance at multiplelocations.The clearance between the surface of the top piston ring andthe ring land should be no greater than 0.075-mm(0.0030-in).If the clearance is greater than specifications, replace thepiston ring.If the new ring does not reduce the top ring side clearanceto 0.075-mm (0.0030-in) or less, install anew piston.The top compression ring may be installed with either sideup. There is a locating dimple on the 2nd compression ring near theend for identification of the top side. Install the 2nd compressionring with the dimple facing up.The clearance between the surface of the second piston ringand the ring land should be no greater than 0.069-mm(0.0026-in).If the new ring does not reduce the clearance to0.069-mm (0.0026-in) or less, install a newpiston. Note:Measurements of all components should be taken with thecomponents at normal room temperature. For proper piston fit, the engine block cylinder bores mustnot have excessive wear or taper. A used piston and pin set may be reinstalled if, aftercleaning and inspection, they are within specifications. Inspect the engine block cylinder bore. Refer toEngine Block Cleaning and Inspection.Inspect the piston and the piston pin.Use a bore gauge-(1) and measure the cylinder borediameter. 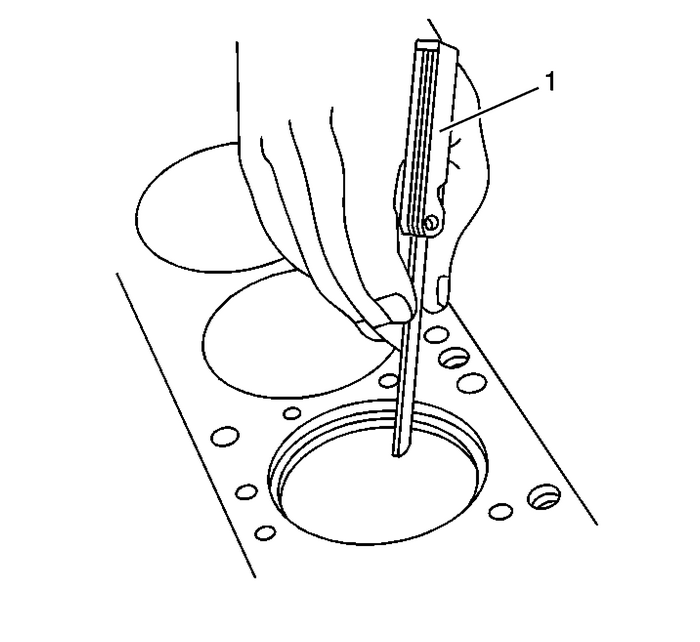 Measure at a point 64-mm (2.5-in)from the top of the cylinder bore. 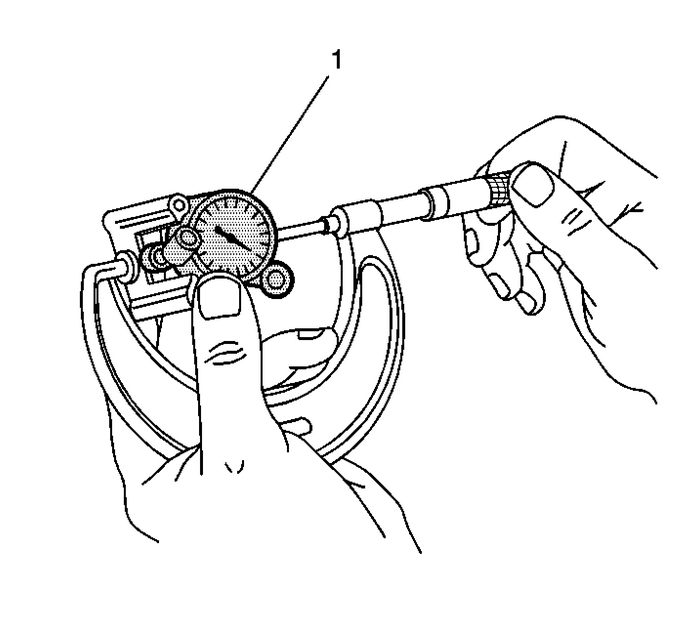 Measure the bore gauge with a micrometer-(1) andrecord the reading. 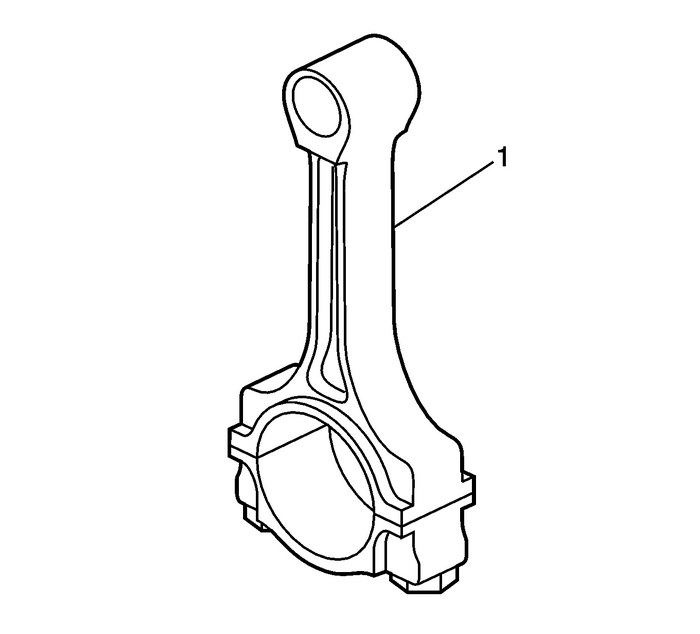 With a micrometer-(2) or caliper at a right angleto the piston-(1), measure the piston 14-mm(0.570-in) from the bottom of the skirt.Subtract the piston diameter from the cylinder bore diameterin order to determine piston-to-bore clearance.For proper piston-to-bore clearance. Refer toEngine Mechanical Specifications.If the proper clearance cannot be obtained, select anotherpiston and measure for the clearances.If the proper fit cannot be obtained, hone the cylinder boreor replace the cylinder block.When the piston-to-cylinder bore clearance is withinspecifications, mark the top of the piston using a permanent markerfor installation to the proper cylinder. Refer toSeparating Parts.